A Sustainable Approach Puts Charcon Top of the Class at Manchester Metropolitan University. When Manchester Metropolitan University announced plans to consolidate seven of its campuses into two, including a £140 million campus in Hulme, its vision was to create “the most sustainable campus in the UK”. The new Birley Fields Campus would represent an exciting chapter in the ongoing regeneration of Hulme, and promised to breathe new life into a site earmarked for development since clearance in the 1990s. The new campus would open up new paths of higher education to local people and is at the heart of the community for residents to benefit from the facilities, training and knowledge at hand. A brand new centre for teacher training and health facilities would educate up to 6,000 professionals for the region’s schools, hospitals, health and social services. Over 300 new jobs would be created and the local economy in Hulme and Moss Side would be boosted by £29 million. 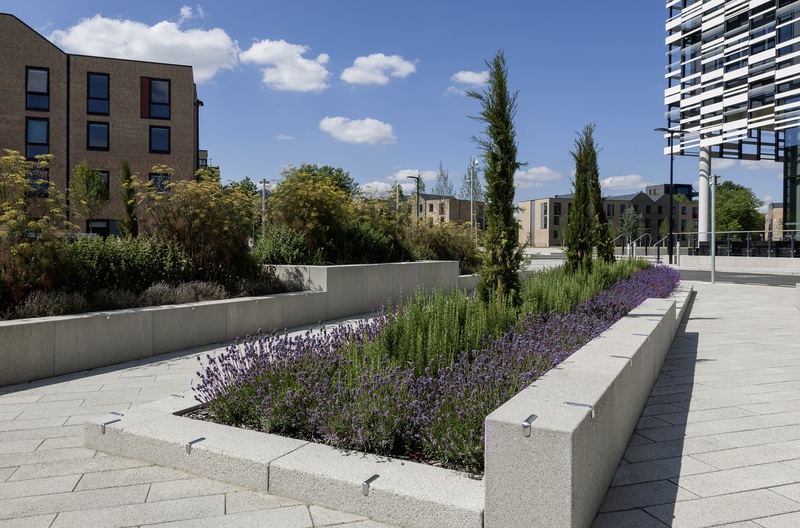 Integral to the project was finding the right partners to deliver an extensive landscaping programme that would link the whole campus together, including a public square at the heart of the development. Charcon was selected to deliver the landscaping materials for the new super campus. Materials including 6,326m² of EcoPave, 4,000lm of Eco Countryside Kerb, 896lm of wide top Eco Countryside Kerb units and 398 Eco Steps were supplied alongside 1,006m² of Charcon premium Andover Textured flag and block paving. Products which were specified due to their unique range of shading and sustainable qualities provided optimum design flexibility and strong visual appeal. The Andover Textured paving was utilised to complement the external design of the teaching facilities and blend in with campus surroundings. As part of the Birley Fields Campus development, Manchester Met aimed to meet certain sustainability targets and a number of green credentials. The use of Aggregate Industries’ Eco range helped meet these specifications, as EcoPave Textured contains up to 53 per cent recycled and reclaimed materials, while Eco Countryside Kerb is made with up to 82 per cent recycled and reclaimed material. In addition to providing materials, Aggregate Industries helped develop bespoke kerb angles and Eco units, providing on-site landscaping solutions. 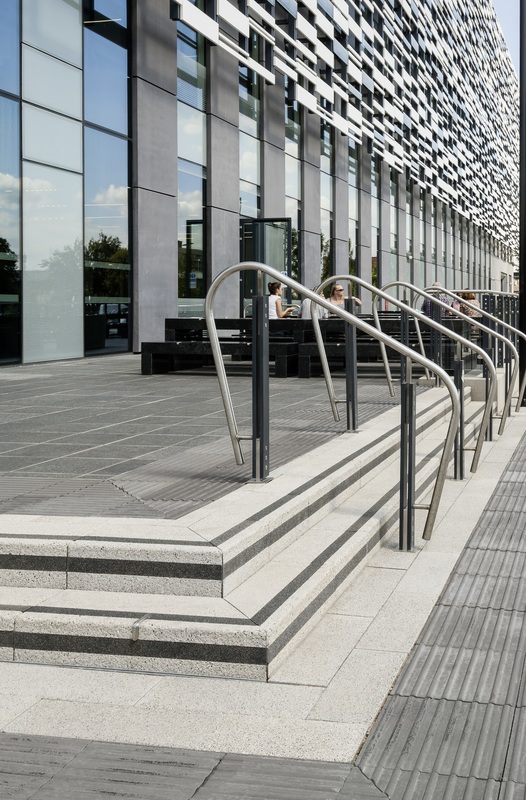 Charcon Step Inserts were also incorporated into the design of external steps to reduce the risk of slips and increase visibility in areas lacking natural light. As a result of such a comprehensive service, which saw the successful completion of the landscaping phase around the Sugar Cube building, one of several new teaching facilities on-site, Aggregate Industries received an additional order for materials that would be incorporated around the student accommodation. The extended contract saw Aggregate Industries supply an additional 521lm of wide top Eco Counterside Kerb units, 45m² of Andover concrete block paving and 1,175m² of EcoPave Textured paving blocks. 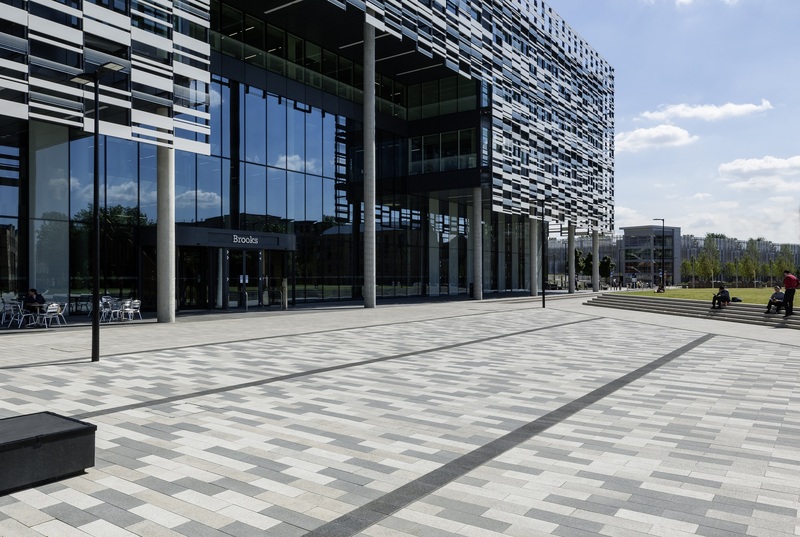 With the new student accommodation being amongst the most environmentally friendly buildings in the UK, Aggregate Industries’ Eco Countryside Kerb and EcoPave block paving were the perfect choice for the University. Developed to maximise resource productivity, the products provide optimum use of finite resources by minimising waste and incorporating high proportions of non-primary materials. Mike Davies, Specifications and Major Projects Manager at Aggregate Industries, said: “The Birley Campus project has been an exciting one to work on and we were delighted our Charcon product range and expert advisory role on-site has been able to contribute to such a prestigious educational facility.